Guatemala has a rich Mayan history that dates back to the first millennium A.D. and is evidence in much of their culture and in ruins still dotting the country. After three centuries under Spanish rule, this country won it’s independence in 1821. While rich in renewable resources, this nation has faced the deadly rages of guerrilla war and instability in government. In 1996 a peace agreement formally ended the 36-year war that ripped across the nation and left more than 100,000 people dead and some 1 million refugees. Guatemala is slightly smaller than the size of the U.S. state of Tennessee but contains 13.5 million people who are largely Roman Catholic. Guatemala is the most populated country in Central America and about 61 percent of its population is rural. This is largely due to the large indigenous presence in Guatemala. The descendants of Mayan Indians account for 56 percent of the nation’s population — the people groups that Reach World Mission will be helping to train up to be leaders in their churches and ministries. There are many Mayan descendants who continue to practice Mayan beliefs often mixed with local Catholicism. Still, a strong population of Protestant Christians including growing evangelical congregations are training up true disciples in Guatemala. The nation has hot coastal plains, mountains and limestone plateaus. Numerous volcanoes sit among the mountains, some are active and occasional violent earthquakes and mudslides disrupt normal activities. Hurricanes and tropical storms also effect safety. Chichicastenango is locate in the department (or state) of Quiche and is located in the western highlands of Guatemala. The city of Chichicastenango (meaning “City of Nettles”) is located about 87 miles northwest of the nations capital, Guatemala City. Settled in the mountains of southwest Guatemala, “Chichi” as it is often called, sits 6,447 ft. above sea level. 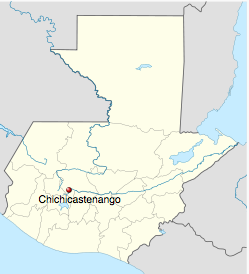 The municipality of Chichicastenango (including the urban center (population 45,549)) has a population of 101,864 – 107,193 people — that’s roughly the size of Green Bay, Wisconsin or Downey, Califonia. Get a great overview of city services available in Chichi here.